We're on the road again today and heading east towards the Grand Canyon. But our first stop today was the Hoover Dam, since it is just east of Vegas and on the way. I chose to forgo walking on the new bridge over the dam, and just spent a little time on top of the dam itself. It's obviously a real feat of engineering in its day and pretty impressive. There are four penstock towers on the Lake Mead side of dam, with two on the Nevada side and two on the Arizona side. There is a clock on each side showing the time in the state. After going back on the road for a while, we made a stop at a truck stop in Kingman to refuel and pick up some supplies. This is another town mentioned in the lyrics of Route 66. 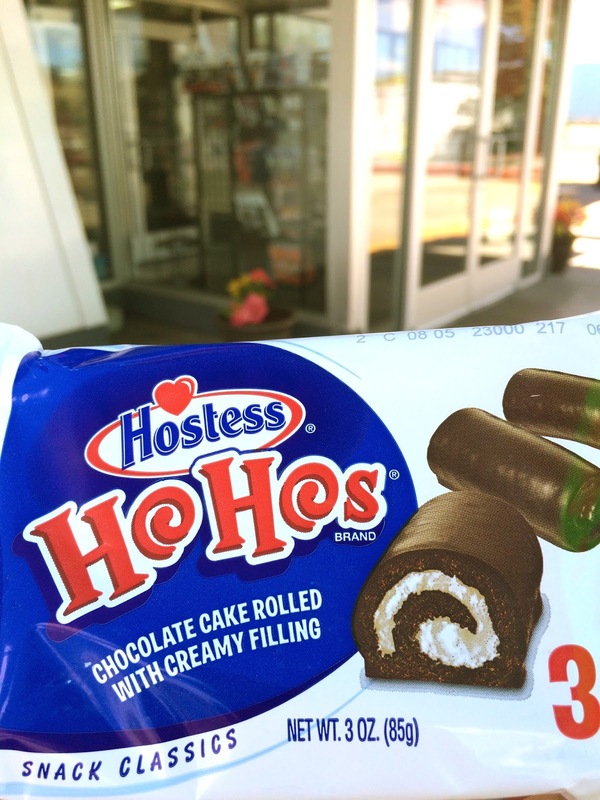 I got myself some Ho Hos just for the hell of it... more memories from my years spent in this country. 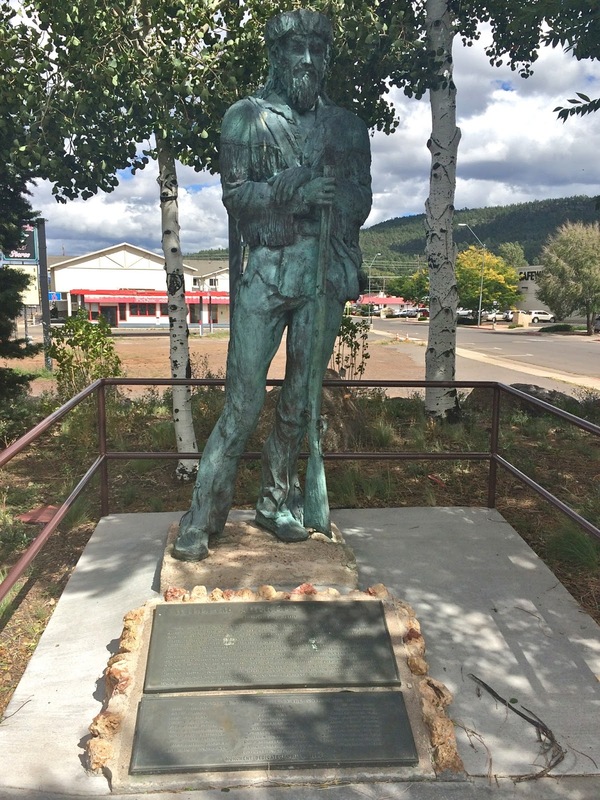 We drove into Williams, another town proud to be on Route 66 and declaring itself "the gateway to the Grand Canyon". We saw some picnic tables in the outskirts and decided to stop to have our picnic lunch. 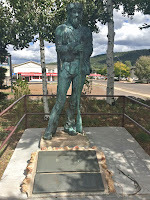 There was a statue of Bill Williams, the namesake of the town, as well as a memorial honoring people from the town who had served and given their lives in the U.S. Armed Forces throughout the years. We drove north after lunch, and not long after we found ourselves inside Grand Canyon National Park. We parked the car and immediately walked to the area around Mather Point and the Amphitheater. This is the area with the most tourists as it's right by the parking lots and the Grand Canyon Visitor Center. After hanging around the area for a little, I decided to trek out to the western end of the canyon. We drove the car and parked by the lodges in the Grand Canyon Village, and then took the Red Route Shuttle Bus and headed west. As the bus has set departure times at each stop along the route and needs to wait for a couple of minutes, I was able to hop off, snap a few quick pics, and hop back on. The bus stopped at Hopi Point - said to be the most popular spot to take in the sunset - but I wanted to head further west. We got off at Pima Point - the second-most westerly stop on the route - and the second-most popular spot to watch the sunset. We got a good view of the Colorado River from this spot, and stayed here till the sunset. Unfortunately there were lots of low-level clouds today, so much of the canyon was shrouded in shadow. The winds were also pretty strong, which swept up lots of dirt and sand into the air - and made the sky a little hazy. Not the best conditions to produce beautiful pictures, but the view was still stunning. We caught one of the last buses back to the village, and drove back to our hotel in Williams. We had brought along lots of leftovers from last night's dinner, and used the microwave oven in our room to warm them up for a sumptuous dinner. I'm so glad I finally made it to the Grand Canyon at my age. Would definitely love to come back and take in the views another day.